Toast pastries as directed on package, reserving icing packets. In small bowl, mix icing and baking cocoa. Add mixture to small resealable food-storage plastic bag; cut off small corner. Place 1 pastry on small plate. Add half each of the banana, yogurt, strawberries and pineapple. Drizzle half of the chocolate icing on top. Garnish with a cherry. Repeat to make second banana split. Serve immediately. 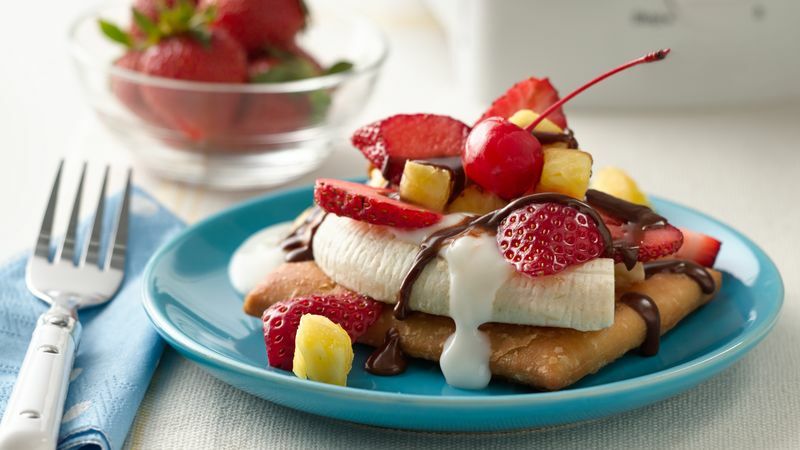 Have the kids add their own twist on their banana splits by offering different toppings like chopped peanuts, slivered almonds, coconut and additional fresh fruits. To make assembly extra easy for your kids, cut fruit the night before, and store in refrigerator in covered plastic containers so they can easily grab them in the morning.